Award-winning Australian demolition giant Liberty Industrial has invested in a state-of-the-art Volvo excavator training simulator. The simulator will travel between Liberty Industrial’s project sites in a purpose built trailer unit that has been converted into a mobile training centre. The latest in excavator simulation training technology, the Volvo Advanced Training Simulator 5.0 is inspired by aviation industry simulation training, and allows the operator to immerse themselves in a realistic virtual experience. 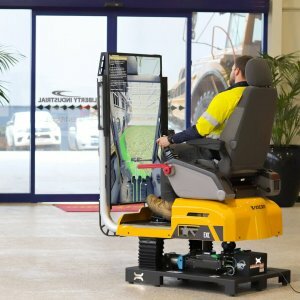 The simulator features a high definition screen and includes realistic graphics and sounds, and a full motion platform incorporating movement and vibration that mimics the experience of operating a machine in a true-to-life scenario. Posted: February 14th, 2019 under General.